It was not exactly “veni, vidi, vici” (ecclesiastical Latin for “I came, I saw, I conquered”). 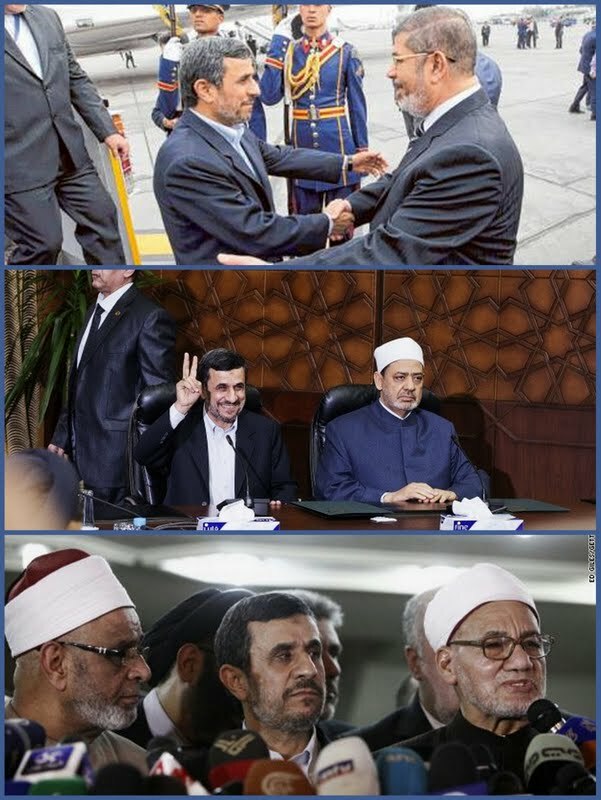 It was more like “I came, I saw, I tried” for Mahmoud Ahmadinejad as he ended the first visit by a president of Shiite Iran to Egypt since the Khomeini Revolution in 1979. He arrived in Cairo Tuesday for a summit of the Organization of Islamic Cooperation (OIC). But his priority was to try and thaw long, frigid ties with the Arab world’s most populous nation following the election of the Muslim Brotherhood’s Mohamed Morsi as president in June. Morsi gave Ahmadinejad a red-carpet welcome on the tarmac at Cairo airport, shaking his hand, hugging and exchanging a kiss on each cheek. But Egypt's presidential spokesman Yasser Ali yesterday said an end to the Syria crisis is a condition to restore Cairo’s diplomatic relations with Tehran. Additionally, Sunni-Shiite tensions dominated talks between Ahmadinejad and Egypt's most prominent cleric Mohamed Ahmed el-Tayeb, the Grand Sheikh of al-Azhar mosque and university, who gave the Iranian leader a dressing down on a string of issues. Al-Azhar is the highest seat of religious learning in the Sunni-Muslim world. Two of our ulema are among those attending this meeting. Their respective specialties are two Shiite philosophers, theologians and scholars, namely Sadr ad-Din Muhammad Shirazi (1572-1640) and Nasir al-Din al-Tusi (1201-1274). “We absolutely reject the extension of Shiite reach” in Sunni countries and in Egypt. Iran must give its Sunni citizens their full rights. Citizenship is indivisible according to modern law and Islamic Sharia. A word about (Iran’s) meddling in the affairs of Bahrain and the Arab countries: The loyalty of Bahrainis should be to their homeland. No one should interfere in the Bahrainis’ internal affairs or in the affairs of Gulf Arab states. Immediate action is needed to bring a halt to bloodshed in beloved Syria. As the Iranian president walked past the ancient al-Hussein mosque near al-Azhar, a man believed to be Syrian attempted to hurl a shoe at him. Unperturbed, Ahmadinejad later visited the mosque and mausoleum of Sayyida Zaynab in the capital's Old Cairo district, where he cried beside the Muslim matriarch's tomb. Sayyida Zaynab was the daughter of Imam Ali, the central figure of Shiite Islam and the cousin of Prophet Muhammad. Ahmadinejad greeted the mosque's superintendents with hugs and kisses. After praying inside the mosque, he headed to the adjacent mausoleum where he shed tears and prayed next to Sayyida Zaynab's tomb. Editorially, Mohammed bin Abdellatif Aal ash-Shaikh, writing for today’s edition of the Saudi daily newspaper al-Jazirah, says the Grand Sheikh of al-Azhar must have “greatly embarrassed” Egypt’s Muslim Brotherhood. “At the same time, the Muslim Brothers want to draw closer to Iran, the Number One enemy of Gulf Arab countries, to sponge off financial aid from them. The Brothers’ links with Iran, in other words, are meant to pump off cash” from the Gulf Cooperation Council partners. Except that the Grand Sheikh of al-Azhar Mohamed Ahmed el-Tayeb will continue standing in their way.